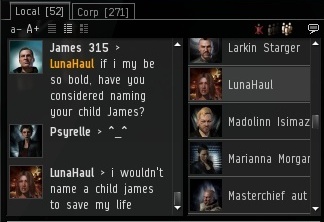 For highsec miners used to getting away with murder (i.e. AFK mining, failing to pay me money, etc. ), learning to obey the Code and their Supreme Protector can be a bit of an ordeal. Though I always offer to help them adjust to their new situation, sometimes the miners actually lash out at me instead. Talk about displaced anger! In short, miner tears are nothing new to me. Every so often, however, a miner will shed tears that are so unique as to be noteworthy. When that happens, I will do my best to remember to log them, for they are a marvel intended to be experienced by all EVE. Welcome to a new feature, dedicated to celebrating such tears: MinerBumping.com's "Tears of the Day." I visited the New Order's newly-acquired Kino system today and did my duty. 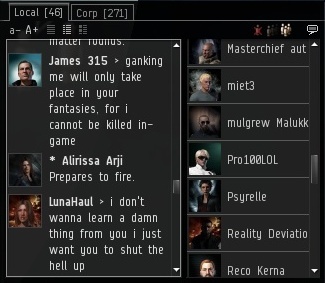 Because a major patch was installed today, CCP needed to shut down the server for an emergency reboot. 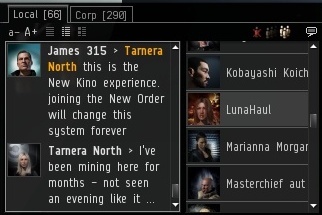 Everyone in system took a short break from mining as we awaited the reboot, and we all reflected on the day's experience. Sadly, we were rudely interrupted by a miner who felt the need to make a parting shot before the reboot. 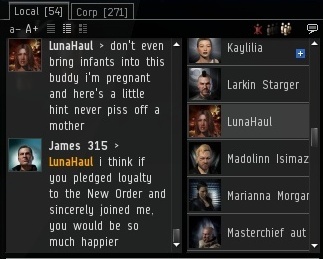 I reminded LunaHaul of the fact that infants do not initially want to learn how to walk; they prefer to crawl. Yet it is the job of the parent to teach the child to walk. The parent knows better than the child, just as I know better than the miners. Hopefully in the intervening months, our miner will learn patience. 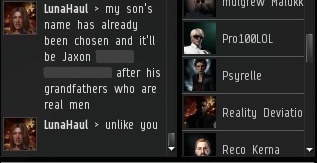 Patience is very important when raising children--and highsec miners! You're full of yourself and you know it. I don't know what kind of mental disorder you have, but it must be quite severe, in order to make anyone compare AFK mining to murder. I hope to see the end of your little e-peen empire soon. If it doesn't end soon, I'll be more than happy to lead an army to annihilate you. A perfect addendum to an article called Tears of the Day. We're coming up on the 1 year mark and the end of his e-peen empire is nowhere in sight. Any additional comments, anonymous poster #1? Do I hear two years? I'm sure D-day is just around the corner. Six years on, the New Order is still going strong!